Perfect for Valentine's day, or any day of the year!! By all means, I'm a winter person and still in mood of winter, Love cold weather and the delicious concoctions we can enjoy in such weather....... soups.... stews.... and some hot cocoa! Today, I'm sharing with you, one of my winter favorite, which I love making for me and Vishal, and that is..... looks like you guessed it! but, I'm still gonna tell you..... it is..... Hot Cocoa!!! oh no no... Skinny Hot Cocoa!! Your ever favorite, hot Cocoa, or hot chocolate..... warm, chocolaty, silky smooth and comforting drink, a skinny way!! Well, well.... when I stared making Hot Cocoa, I was really bummed with the recipes I was looking at, all those loaded with butter, chocolate, sugar kinda drinks are not my thing, and I can never make something happily for Vishal, or for that matter share with you, which I don't think is good. So.... this skinny hot cocoa is my take on creamy and indulgent hot drink of centuries....instead of lots of butter, chocolate, and sugar... 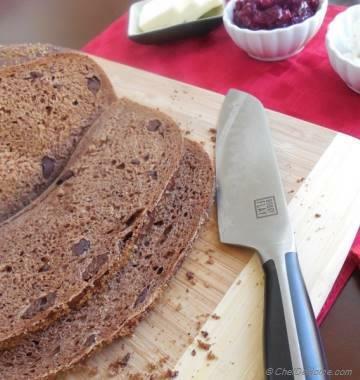 I like to use raw organic cocoa, a little butter, a little dark chocolate, honey, a secret ingredient, and lots of love! 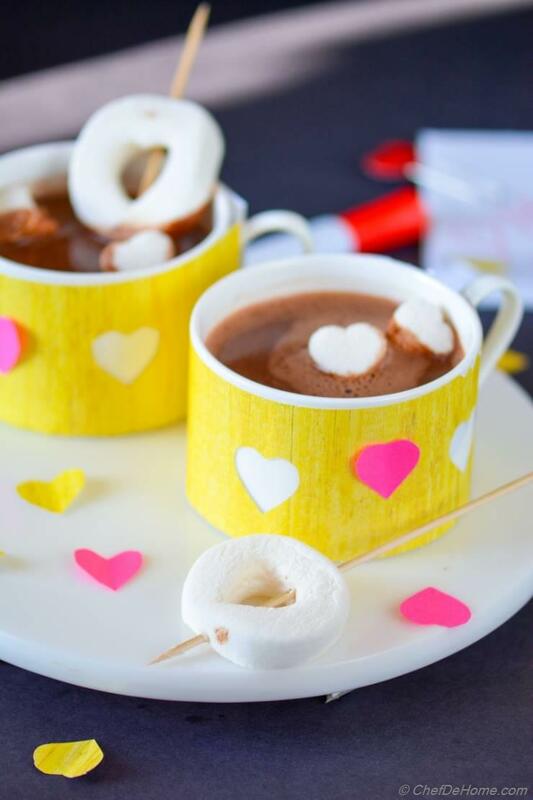 And love makes this Hot Cocoa perfect for Valentine's Day Breakfast! Actually... any thing cooked with love is perfect for special Valentine! And my secret ingredient... not so secret actually... is Coffee Extract. If you never tried coffee extract before, I strongly recommend trying it in hot chocolate drinks or chocolate deserts. A little bit of coffee can really bring-out flavor of chocolate, and this what this extract doing here! Making my skinny, low-chocolate, hot cocoa - super addictive and yummy! Alright... you know I'm keeping my posts sweet and short these day.... spent whole yesterday proof-reading my cookbook.... ah... whole day reading recipes....line by line..... Seriously!! I had to get up and eat four times.... four times!! because I was drooling looking at and reading my own recipes.... no kidding, food business can be really overwhelming if you don't keep a check on how much you eat... It is just January, the first month of year.... and I'm losing track of my diet.. no good.... today, double time on stair-climbing, promise!!! 1. Baileys Irish Cream: If you like a little touch of Irish Cream and can't find Coffee extract, add a shot of this instead. I bet, you will love it! 2. Espresso Shot: This is yet another favorite of my significant half, hot cocoa with an espresso shot, perfect for a coffee addict! 3. 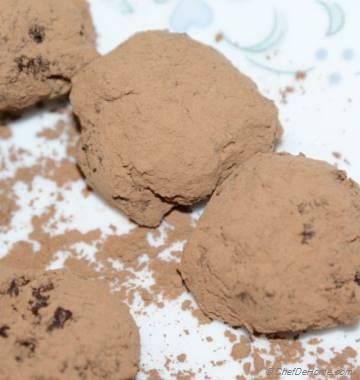 Instant Coffee Powder: If I'm out of extract, and making hot cocoa, with espresso, for Vishal, I make mine with a teaspoon of instant coffee powder. I do love coffee, but I'm a medium-roast person! 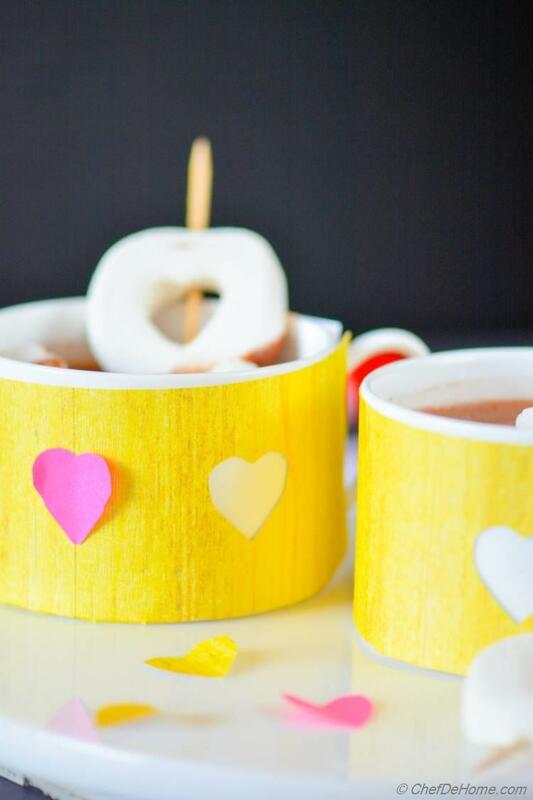 PS: I hope you like my make-shift Valentine-theme Cup Wrappers and little heart confetti :) Super cute, isn't it? Valentine's Day brunch can be extra special if you also serve one of these! 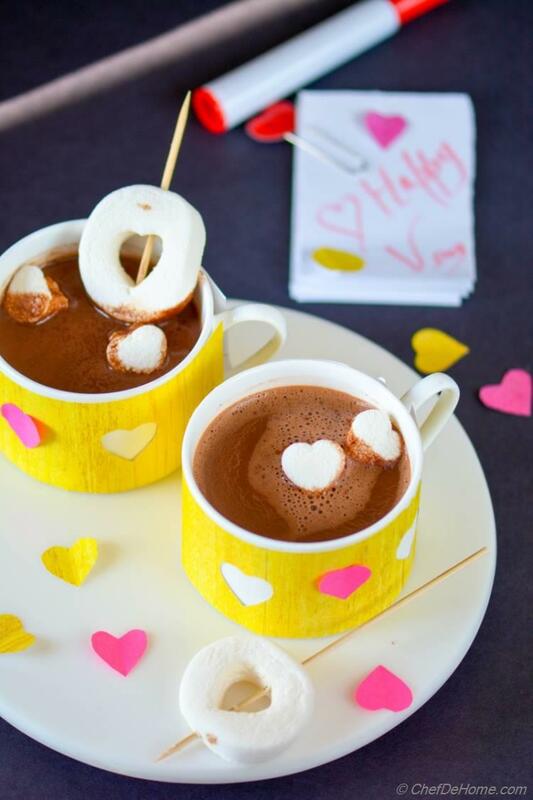 Total Time 10 minutes Prep Time 0 minute Cook Time 10 minutes Difficulty Easy Yields 2 Cups Serves 2 Notes Perfect for a Skinny Valentine's Day Brunch! Smart Swap Replace milk with water or almond milk to further reduce calories. 1. 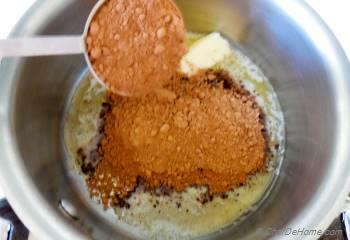 In a sauce pan, add butter, honey, and cocoa powder. 2. Whisk on low heat until everything is mixed and has syrup consistency. 3. 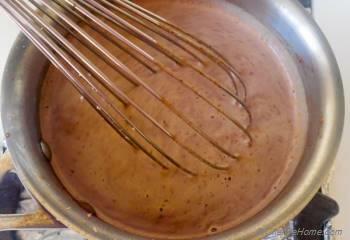 Whisking continuously, add 2 cups of skimmed milk, make sure cocoa is fully dissolved in milk. Set stove to simmer, mixture should not boil. 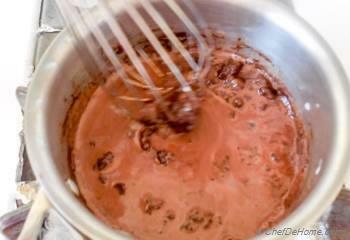 Add nutmeg, coffee extract, chocolate chips, salt, then whisk until chips are dissolved in cocoa. 4. Remove from heat. Pour in two mugs. Serve hot topped with marshmallows or some whipped cream. Enjoy! I have used big marshmallows , sliced in half, then used a small cookie cutter to cut out heart shapes. Tina, thanks! oh yeah, me too love those hearts :) I'm sure you will love this version of Cocoa too! Thanks a ton for stopping by! 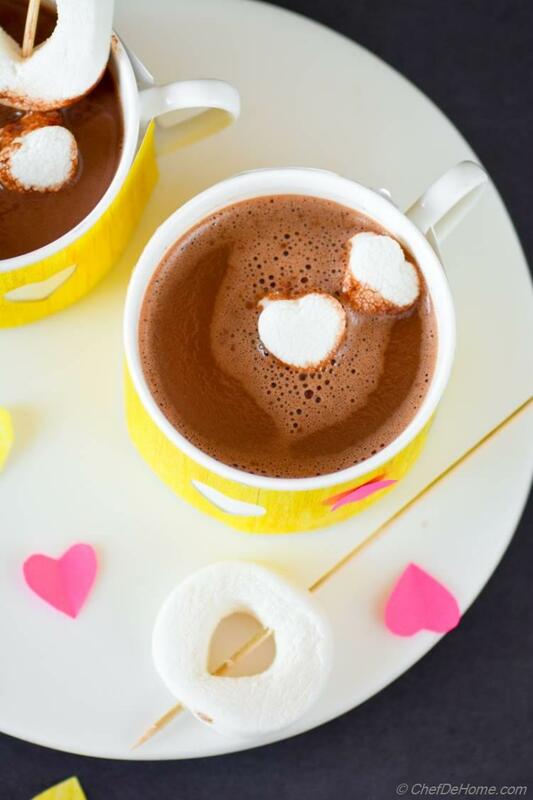 Love those little heart marshmallows! I'm always up for trying a new hot cocoa recipe and this looks delicious. Being a craft person is so much more than cooking! I feel exhausted so soon! feels like enough... I mean, when I cut heart wraps, I felt why the hell I didn't cut in red color, but it was too much for me to do it again! :) Thanks for mentioning about cookbook, Manali! I'm writing book on salads, self-published :) Almost ready, and it will be available soon!! Have a great weekend!! Jess, thanks! I so love snow and I'm so jealous :) I agree, Hot Cocoa is best for such a day! Agness, thank you!!! I'm so glad you love it! I simply looooooooooooooooooove it! So freaking yummy! Yummy! I know!! Oriana, weather in Calfornia is so famous for being sunny! but, somehow it's cloudy today! Chance of rain, may be!! I wish, I can pass you a cup, right away! You too have a great day! I am so jealous about your wonderful California weather!! This cocoa looks heavenly. I could use a cup right now. Have a great weekend! Ritu, thanks!! You made my day, such a beautiful words! thank you! It is the most beautiful cocoa I have ever seen. Perfect for valentine day. It looks delicious. :) Manali, I can't agree more! we, humans!! Even if I was in East Coast, I'm sure I will be praying for sunshine too! And thanks for mentioning these heart wrappers, I made'em myself!! first time ever! I may be a good cook, but not a designer or craft person, just managed to draw some hearts and cut'em :) But they sure look cute! haha we are never happy with what we have...human nature! ;) I am sure those East coast people are praying for sunshine! 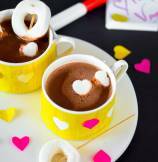 hot chocolate is one of my favorite drinks and this looks splendid..I LOVE the cute heart cup wrappers! Where did you get them from? Adorable! Gingi, thank you so much!! :) I'm glad you like it. Neeli, Thanks! I agree, a cup of hot cocoa, on cold day, always wanted!! 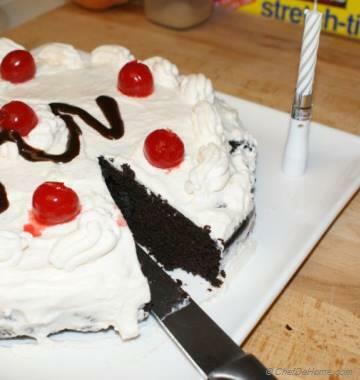 I wish, I can send you some! Its pouring here!!! 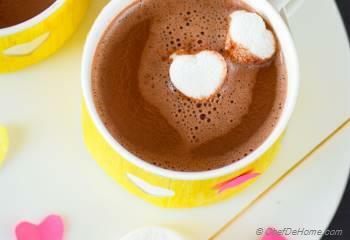 I would love a cup of this hot chocolate right now! !